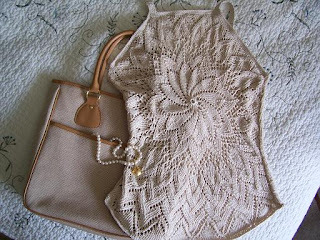 Outstanding Crochet: 2nd Annual knitting & crochet week. Day One: 28th March. A Tale of Two Yarns. 2nd Annual knitting & crochet week. Day One: 28th March. A Tale of Two Yarns. I am so exited to take a part in this knitting&crochet week! This classic crochet thread from Royale in beige, size 10 is my favorite! It's strong, it doesn't become a cotton wool after a few ripping off. Another plus is that I buy it in Joanne with 40% off, since they give you this opportunity almost every other week. Another thing: I love those giant skeins and hate this marketing trick when you buy big skeins with air inside! We are not idiots. The natural color of this thread is classic and look chick! I made quite a few projects using this kind. In all of them I used 2 threads and hooks 2 and 3 mm. Красивые ниточки. Качество даже по фотографиям чувствуется. Нитки в принципе обыкновенные, но ровные и скручены так, что не начинают превращаться в вату после распускания. Я только что связала топ из другого хлопка, цвет мне очень нравится, а на готовое изделие не хочется смотреть, какой то он рыхлый, чувствую, носить не буду. Nice! Its always good to share experiences. Well, I thougth that line was left in my house! :)) Have a nice week!